The escapes here promise everything from sea turtle photo ops in Bora Bora to a Green Concierge in Santa Monica, California, who will snag you a hybrid taxi. The Maple Leaf’s ecotourism cruise includes stops for wine on uninhabited islands. Photo © Maple Leaf Adventures. 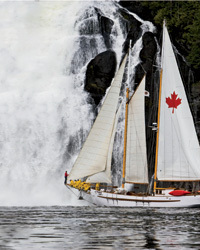 The Maple Leaf is a 92-foot schooner with a low carbon footprint (thanks to onboard recycling and composting). This new route through British Columbia’s Inside Passage features plenty of whale and dolphin sightings. 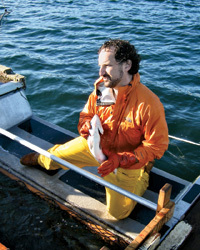 On the menu: Halibut, salmon and rock cod reeled in directly from the boat. From $4,600 for nine days; mapleleafadventures.com. 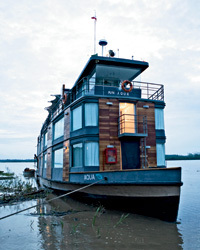 This ecotourism trip includes river rafting by day and comfortable lodge stays by night. Photo © Rouge River Lodges. Instead of the usual freeze-dried dinners, paddlers have locavore meals. In addition, a portion of the trip’s profits support the Klamath-Siskiyou Wildlands Center, which helps maintain the Rogue River. On the menu: Wild-caught sole, Willamette Valley wines and Rogue Creamery’s famed raw-milk blue and Gorgonzola-style cheeses. From $1,199 for four days; rowadventures.com. In 1917, this six-story department store was Panama’s tallest building. Renovated as a hotel, it will be the most luxurious place to stay in the Casco Viejo neighborhood when it opens this summer. The developer is also committed to building affordable housing in the area. On the menu: Guacho, a Panamanian seafood stew. Doubles from $220; conservatoriosa.com. Outside the eco-conscious Shore Hotel. Photo courtesy of Ryan Gobuty, Gensler. This minimalist hotel has a Green Concierge to help guests find hybrid taxis and plan eco-activities. The Vanderbilts once had a 17-room apartment in this 1926-era hotel, which now uses sustainable heating, cooling and lighting. On the menu: Dishes by chef Serge Devesa, made with produce from the rooftop garden. Doubles from $259; ichotelsgroup.com. Le Méridien’ draws many ecotourists. Photo © Le Meridien Bora Bora. This South Pacific resort has over-water bungalows and amazing sunsets, but the hotel’s real stars are the sea turtles, says general manager Denis Le Nohaic: “They are our local celebrities.” After spending $12 million to update 99 bungalows, the resort is building a $1.8 million turtle observatory and ecological center, where staff will rebuild damaged coral and restock endangered fish. On the menu: Local mahimahi with a lime-and-toasted-coconut crust. Doubles from $732; lemeridien-borabora.com. A staff marine biologist leads educational ecotourism expeditions. Photo © Hualalai Resort. It’s always Shark Week at this 865-acre property on the Big Island, where a staff marine biologist leads educational expeditions to see and feed the predators, as well as turtle-tagging outings and eagle-ray feedings. After restoring nearby coral reefs, the resort is lobbying the state to create a marine preserve along its coastline. On the menu: Shrimp from the resort’s own aquafarm; an oyster farm is next. Doubles from $635; fourseasons.com. This ecotourism resort is set in the middle of an untouched cloud forest. Photo courtesy of Mashpi. A passion project of one of the wealthiest men in Ecuador, this super-eco-lodge (powered by its own hydroelectric plant) is set in the middle of an untouched, Avatar-like, 2,800-acre private cloud forest. A staff biologist leads walks to view neon-colored frogs, giant wild orchids and hundreds of bird species. Guests can also glide above the jungle canopy in an open-air gondola. On the menu: Sea bass baked in a banana leaf. 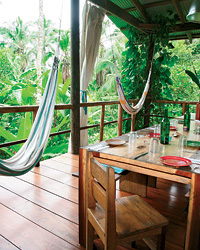 $1,552 per person for three days; mashpilodge.com. Mayan ruins near ecotourism center Belcampo Lodge. Photo courtesy of Belcampo. A recent renovation has turned this 12-suite rainforest jungle lodge (also close to fishing spots and Mayan ruins) into a place for the artisan food set. An agritourism center whose partners include Blue Bottle Coffee, St. George Spirits and Vosges Haut-Chocolat gives guests the chance to roast coffee beans, distill rum and make their own chocolate bars. Inside scoop: Belcampo Belize is the brainchild of Anya Fernald, founder of Oakland, California’s massively popular Eat Real Festival. On the menu: Pastured-chicken tamales. Doubles from $330; 011-501-722-0050 or belcampoinc.com. Book eco-volunteer trips, like working at a panda reserve in China, at goeco.org. 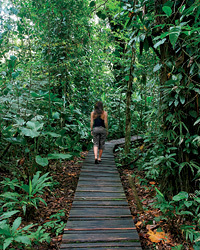 Calculate your carbon footprint and then purchase C02 offsets at travel-green.org.